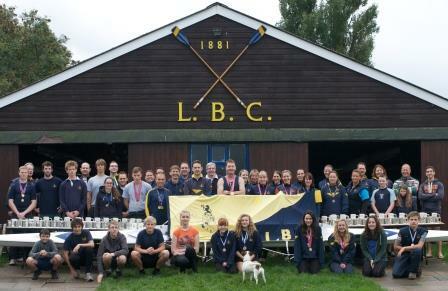 With 237 individual cups and medals won in 94 separate races by 46 competing club members, Loughborough Boat Club has just celebrated one of its most successful competitive years. In an all-inclusive and family club, rowers ranging from 12 to 60+ have been celebrating their wins throughout both the long distance Head Race and Regatta seasons. At competitions ranging from London, Stourport, Ironbridge, Bewdley and Peterborough to more local events at Leicester, Nottingham and Burton and indeed our home race on the River Soar, our members have supported, cheered and consoled each other. Races have ranged from 500 metre sprints to the particularly brutal 50.2km Boston Marathon. It’s not a coincidence that one of our boats is called Blood Sweat and Tears and in testament to this we have broken records, boats and occasionally ourselves. Congratulations go to junior rowers Emily Senior and Matilda Haines, who have been the best performing crew, taking 10 trophies together in their double scull. Emily having a further 8 wins in her single scull and a further one in a quad makes her the top overall competitor in the club. Matilda having two separate wins also. Other successful juniors have been Scott Boardman with 8 wins, Alex Henry with 8 wins in his single and Bethan Henry and Lucy Agar with 7 wins in their double and one in a quad. Tom Schofield and Rob Parks with 13 and 10 wins respectively in various crews have been the top performing adults, followed closely by club captain Keith Hudson with 9 wins and Tim Ives with 8. Zoe Hudson and Erica Gummery lead the ladies with their 6 wins together and Zoe’s coxing cup. Winning cox of the season is Oisín McNally-Reilly. Enormous thanks goes to Stuart Ward our head coach, who himself received a Diamond Jubilee medal from British Rowing last year and has also received a British Rowing award for volunteer of the year. Despite all the training and racing, being up at dawn, out in all weather and all the blisters and injuries, we have ensured that it’s not all work and no play. Over this year we have celebrated with bonfire night, Christmas and annual dinner and a club wedding.